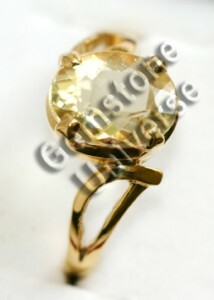 Golden Yellow Brazilian Heliodor Set in Ladies Loupe Design Ring! Comments Heliodor a mineral variety of Beryl gives far more superior results than a Golden Topaz or citrine as a Yellow Sapphire substitute. Patrons have reported good results.